Christmas Co-chair Barbara Mills, 2nd VP Lisa Gerould, and representative to the Mill Creek A&B Board Judy Morrier celebrate at the Mill Creek Garden Club Christmas Party. Photo credit: Mill Creek Garden Club. By Lyndal Kennedy, Public Relations, Mill Creek Garden Club. It may have been freezing outside, but at Shawn O'Donnell's Restaurant it was warm and jolly. 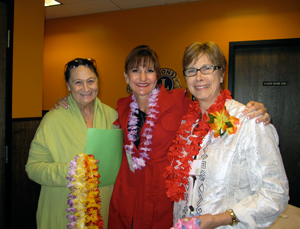 The Garden Club enjoyed every single second at their "Christmas in Hawaii" party on December 10th, 2013. Everyone was presented a lei as they arrived. The room was so festive you couldn't help smiling. The tables were decorated with tall glass vases filled with blooming Paper-whites. And everyone received a Christmas gift of 2 Paper-white bulbs. Lynn Menne gave a demonstration on how to plant the bulbs. Holiday baskets were raffled off, mimosas were available and the room was packed with chatting, smiling and laughing members and guests. Barbara Mills and Lynn Menne were co-chairs. They and their committee did everything possible to put us in a warm Christmas spirit. Lyndal Kennedy was the MC and as usual everyone enjoyed her antics....hula skirt on her shoulders, straw hat on her head topped off with a jingle-bell santa hat. Here's to a warm and merry Christmas for all. The Mill Creek Garden Club is a group of gardeners, both experienced and beginners, who meet at Shawn O'Donnell's, 122 128th Street S.E., Everett, on the second Tuesday of each month, September through May. The meetings start at 11:00 a.m. with a program which may cover either floral design, indoor or outdoor gardening, green practices, landscape design or sound horticultural methods. The program is followed by a lunch combined with good fellowship. The yearly dues are $30 and lunch is $15 for members and $20 for guests (lunch costs subject to change). Reservationa are required. In addition to the regular meetings, there are tours to places of interest for gardeners. For more information please visit our website www.millcreekgardenclub.com. To make a reservation, call Lisa Gerould at 425-890-4512 or email her at lgerould2@gmail.com.